This past week I was relegated to a pair of wines that I was not overly excited about, but needed to taste, for information purposes (though I did not drink much of it). To be honest I have never been a big fan of the Hermon whites or reds, or most of the Golan wines. They have always been B to B++ wines, and for the price, not very exciting or worthwhile. I bought a couple of these wines, a few weeks back, because I thought I was going to bring them to the family get together, but I brought some better ones instead. So, I was left with these wines, and it was definitely time to drink up or cook with them. Personally, I would have cooked with them, if I had known what they tasted like in advance, but hey, this is all about information gathering, so gather I did. 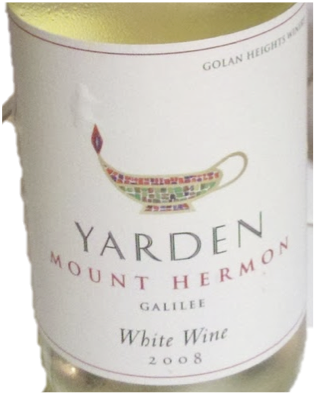 Please note that the Mount Hermon label, is to Yarden what the White Zinfandel label is to Herzog. That being, they are both the main cash cows for the wineries. Why? Most wine drinkers are not interested in drinking an El Rom or a Generation 8 To Kalon Cabernet. Instead, they want easy drinking, quaffing wines. The Mount Hermon and White Zinfandel are exactly that, wines meant to be enjoyed now. Wines that do not need age on them to make them accessible. That said, I have already stated my opinion on the Herzog’s White Zinfandel, and now I can add Mount Hermon to that list of wines. Again, they are fine wines, but not ones I would spend my money on. Yes, I am a happy card-carrying member of the wine snob association, and I hope one day to be its president! The nose on this straw colored wine is mineral and off to start, after time it opens to rich lichee, grapefruit, guava, sweet lemonade, mineral, slight oil notes, floral hints, honey, and mineral. The mouth on this light to medium bodied wine is floral, with honey, lichee, guava, lemon apple, and wet grass. The mid palate is balanced with nice acid, lichee, lemon rind, mineral, and floral notes. The finish is long and spicy with honey, lichee, mineral, floral, lemon rind, wet grass, bright acid, guava. An OK quaffer. The nose on this purple to black colored wine is rich with oak, chocolate, vanilla, cherry berry, currant, blackberry, crushed herbs, spice, black pepper, and graphite. The mouth on this medium bodied wine starts off with a very and almost unbalanced fruit forward cherry berry slush, along with currant, and spice in the background. The mouth feel is smooth and plush, but the fruit forward mouth bugs me. Over time as the wine softens, with nice tannin and plush style, but the fruit starts to fall off with cherry, currant, and blackberry showing lightly, making it more of a smooth oak and black fruit mouth. The mid palate is balanced with oak, acid, crushed herbs, vanilla. The finish is long but unbalanced with more cherry berry and oak. Again, over time, the finish softens with nice oak, chocolate, crushed herbs and a hint of black fruit. Drink up, but not a wine for quaffing, this is wine to be drunk with food or just cooked with. Posted on November 23, 2011, in Kosher Red Wine, Kosher White Wine, Wine and tagged Cabernet Sauvignon, Golan, Mount Hermon, White, Yarden Winery. Bookmark the permalink. 1 Comment.